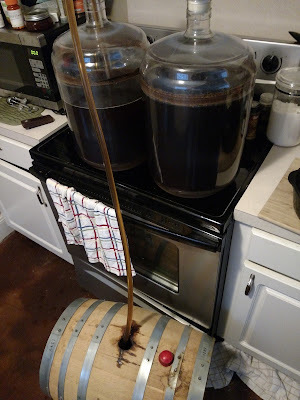 I've been mulling over in my head what to brew for the recently acquired 10 gallon rum barrel. I finally settled on a nice malty Bière de Garde to balance out the spice from the rum. This is my first 10 gallon batch brew day on my system so I knew it will be a bit of a challenge. Primarily having a boil volume higher than my kettle capacity. I debated on doing two separate brews or trying an idea of adding the second runnings throughout the long two hour boil to achieve the volume needed as well as achieve the target gravity. The idea of adding the second runnings came from a conversation with Nate Walter, brewer at McKenzie Brew House. wort is boiled off to reach my target volume and gravity. I had gone back and forth on what I wanted to go into the barrel. I worked up many recipes with a couple of them being quite complicated. In the end I decided on the much simpler recipe above. It does still have some of the specialty and flavor malts in it of course. I think this will be the best way to stand up to and blend with the flavors that the rum barrel will introduce. Huge krausen on this starter! I made a starter with two of the vials I had of the White Labes French Ale (WLP072) on 1-12-14. It was a little sluggish to start but eventually it really took off! I wasn't sure what I was going to do had it not since I really like the profile of this yeast. I guess I would have tried to use White Labs Kolsch/German Ale (WLP029) yeast since others have used that with some success. I will be using that soon for a beer I'd like to have ready in March. More on that in another post. I decanted and stepped the stater up to just under 1600mL. I don't count yeast (yet!) but I was sure there would be enough cells in there for this brew. The vials I used to make the starter were packed with yeast. into the boil kettle and not have a ton of trub left over when fermenting. I added in my grains and then added in my water to start the mash. It was definitely the largest volume mash I've done but I got great conversion and hit all the numbers I was looking for. My mash pH was 5.4 after adding a bit of lactic acid in. I then let the mash go for 75 minutes at 151-152F before bumping the temperature up to 168F for the mash out. First runnings going into the boil kettle. I began to fill the kettle and started sparging with 172F water. When I reached right at 11.5 gallons I started collecting the second runnings in a bucket. Originally I was going to shoot for 12 gallons but I wanted to give myself any extra space in the kettle for expansion as the wort began to boil. This was a great idea! Even though my boil wasn't as vigorous as it has been in the past, I was right near the top of the kettle during the hot break. Collecting the second runnings to add in during the boil. The wort smelled fantastic going into the kettle and the second runnings bucket. I really like using Vicotry malt in these Bière de Gardes for a nice bready characteristic. As the wort heated up to a boil, there was definitely some expansion and I'm glad I didn't add over 11.5 gallons into the kettle. There were a few very close calls with the hot break and when I added in the hops. Also as I added in the second runnings, there were more hot breaks presumably from the proteins being added in. I wasn't sure if the process I did was correct but I had spoken to a few other people about this and decided to try it out. I was either going to brew this beer by adding in the second runnings throughout the first hour of the boil or by brewing two separate batches all together. I believe time was saved by doing it this way but it may be a much easier brew session by dialing back the volume and doing two different brews. Either way I ended up with the result I as was looking for. The wort tasted sweet but also had some caramel and maybe even had some bread-y flavors. Like Amos Browne mentioned in his recent post on his blog, Browne and Bitter, we both feel that a longer boil of at least two hours or more is key in this style. You can have a dry beer but still get those wonderful malt flavors that need to be exhibited in this style. I'm still pretty new to the style as this is only my third time brewing it, but I plan on doing a good bit more research and maybe even try to brew a couple of them with a Lager strain as some of the larger breweries do. I have a few tasting notes posts coming up but I'll be updating this post as the fermentation and process goes along. I'll probably have another post of filling the barrel. Until then here is a short video of the mash in the beginning. I'm definitely trying to work on my videoing skills. I'll have a tripod set up soon so I can film more! 1-16-16: I checked on the carboys at 10AM and one of them was fermenting fast and hard. The other was just now getting it's krausen. I may have pitched a bit more yeast in one than the other. 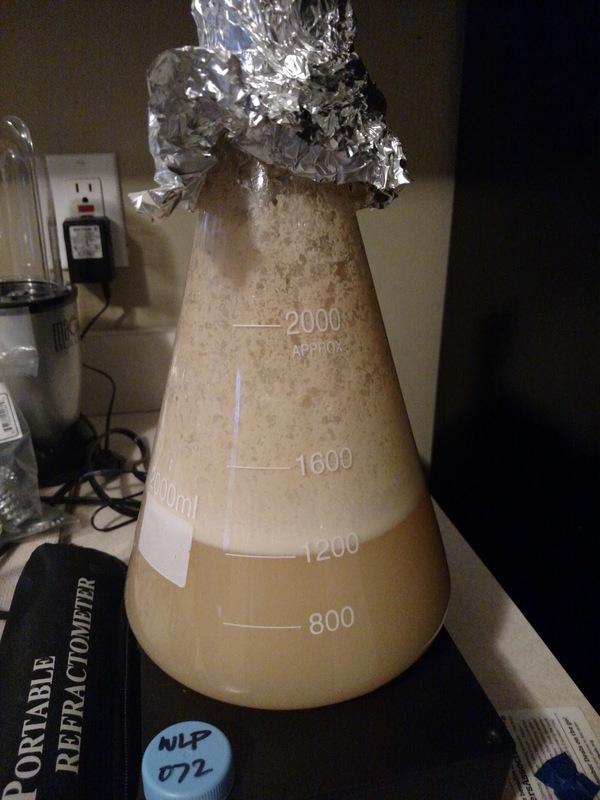 I split a 1500mL starter between the two. We will see if there is any significant difference in the final gravity of each beer. 1-17-16: Both beers chugging away with the same level of krausen. I think both should end up right at the same final gravity. 2-16-16: Both beers sitting at 1.016. 2-20-16: Transferred to rum barrel. I really enjoy your site-just joined although have followed your postings on the saison/farmhouse site. ButI wanted something a little more than the usual latest bottled saison buys posted by all the saison enthusiasts ( which is enjoyable) As a home brewer will look forward to your brewing adventures. Also your link site gathers a really interesting collection brewing blogs Very convenient! Thanks for reading! I'm really glad you enjoy it. I plan on having a ton of posts with information and experience. I definitely wanted to put that list there of all the blogs I frequently visit. I've learned a ton from them and they have more to share with others!